The 1.5-mile confluence of the 57 and 60 freeways in Diamond Bar was rated the worst freight bottleneck in the West Coast, according to a study released this week by a trucking industry group. The Virginia-based American Transportation Research Institute listed the infamous stretch as No. 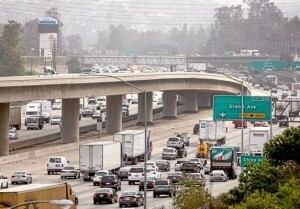 1 for freight delays and truck accidents in California and eighth worst in the United States. The 57/60 meld bumped the previous worst — the 710/105 exchange in Los Angeles — to No. 17. No. 1 on the list was I-95/SR 4 where the George Washington Bridge connects New York with New Jersey. Proponents of the $256-million 57/60 freeway fix hope the ATRI study will shake loose more federal funding from the Federal Highway Administration and the U.S. Congress. So far, the cities of Industry and Diamond Bar have secured about $56 million for a realignment that would include separate freeway exits for Grand Avenue and bypasses for the 60 Freeway, so drivers don’t have to cross several traffic lanes to get to where they want to go. Industry City Councilman Tim Spohn, who spent 33 years as a truck driver, knows the 57/60 can’t compete for the top spot in congestion in Southern California (that belongs to the 101 and 405 Freeway interchange) so he’s presenting the problem in a different light. In short, the dangerous freeway junction on the border of Los Angeles, San Bernardino and Orange counties costs businesses, jobs and the U.S. economy money every time a truck jackknifes and spills its goods. The 2-mile stretch, including approaches, carries 356,000 vehicles a day, not much less than the 405 from L.A. to Long Beach at 374,000 vehicles a day, according to the Federal Highway Administration in a July 2010 report. Of those 356,000 vehicles, 26,000 are trucks carrying goods to warehouses, a figure that is expected to grow to 44,000 trucks by 2035. About 43 percent of all the goods in the United States go through the ports of Long Beach and Los Angeles and about 10 to 12 percent of the trucks from the ports go through the interchange. In addition, many local trucks serving warehouses stretching from Industry to Ontario use the 60 Freeway, said Hasan Ikhrata, executive director of the Southern California Association of Governments. “Because of the location of warehouses in Industry, the San Gabriel Valley and the Inland Empire … this makes it the most sought out area for truck traffic,” Ikhrata explained. The interchange experiences 20 to 30 crashes per mile each year involving trucks, said J.D. Ballas, Industry city engineer. In the past 35 years, since the housing boom in the exurbs, commuters from the Inland Empire and eastern Los Angeles County drive the 60 and 57 freeways to and from workplaces in Orange County and the South Bay (via the 605 and then 405 freeways), Spohn said. “There is as much traffic going down into Orange County as there is going to Los Angeles,” Spohn noted. Both commuters and truckers are victims of the 57/60’s lopsided design, which is the only Southern California freeway interchange not built at 90-degree angles, Ballas said. “In this one they decided to run the freeways side-by-side,” Ballas said. The tangled merge compresses 17 lanes into 14, causing a dangerous dance of cars that results in 300-plus accidents a year. On Thursday, a big rig overturned at the 57/60, spilling crushed concrete and snarling morning rush-hour traffic for hours. Proponents have designed a three-part fix aimed at reducing lane changing which causes side-swiping and rear-end collisions: Phase One would replace on-street left-turn pockets with a dedicated westbound onramp to the 60 Freeway from Grand Avenue. Phase Two would widen Grand Avenue and Golden Springs Road. Phase Three would add a new westbound offramp and auxiliary lane from the freeway confluence, separating vehicles going south on the 57 to Orange County from those going west on the 60 toward L.A. Those going east/north can exit on a separate Grand Avenue offramp and not have to swerve across lanes of traffic to stay on the freeway, Ballas explained.